How to Hold a Home Art Show. If you are an independent artist, gallery space can be expensive, hard to come by or both. 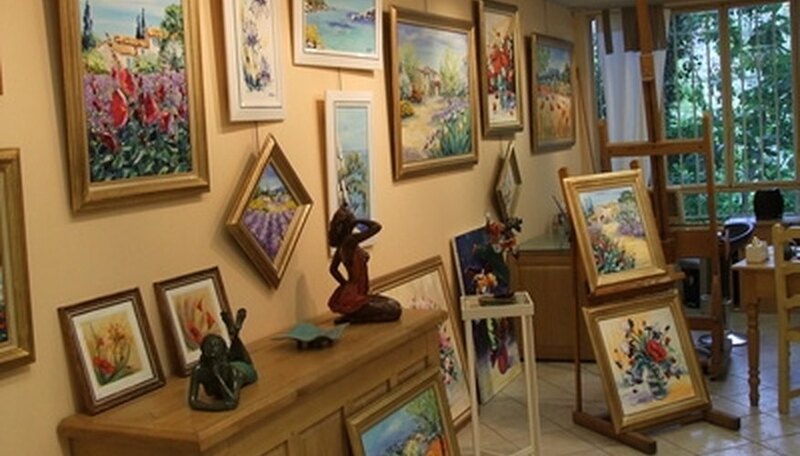 If you have a studio or large enough living space (or a friend with either), a home art show may be an option to explore. This sort of gathering gives you a chance to show your work in a somewhat relaxed setting of your own, making and time to mingle with friends and colleagues. Tailor your show to your space. Keep your guest list small enough that your guests will not be squished if they all arrive simultaneously. If you simply have more people than space, consider holding the show over multiple days and divide the guest list accordingly. Spreading the art throughout your home or studio is a great option, just make it clear which rooms may be off limits with discrete signs. Create an eye-catching invitation. This can be a simply done black and white flyer, a glossy postcard or a thermographed invitation: whatever best sets the tone for your show. Open houses work well for folks with busy schedules to stop by when they can. Make sure the announcements go out at least four weeks before the show for the strongest attendance. Remove unnecessary furniture. Too much seating invites guests to rest and chat and you want them on their feet, mingling and chatting about the art on display. Stowing the extra pieces in a room not being used for the show is best. Store knick-knacks and personal items away to avoid accidental breakages and set a more serene scene. Arrange your wares. Make sure you have ample wall space for paintings. Bookshelves can be used for small sculptures. Three-dimensional items can stand on stools or end tables with enough room to walk around them for full effect. Move a table against a wall and use a variety of easels or plate stands to display a variety of smaller framed pieces. Choose some mood music. Classical is always a safe bet but a post-modern display may cry out for house or techno. Whatever you choose, keep the volume low enough that guests can talk over it without screaming. Set out hors d'oeuvres and drinks. Wine and cheese seem to be the favorites for most art shows. Whatever you serve, make sure to keep portions small (no more than two bites), portable and no-cutlery-required. Keep price tags discrete but visible. You want guests to be able to see the asking price easily but not feel pressured. Business cards from your local office supply store folded in half lengthwise work well for containing the name of the piece, the medium and the price. For art on walls, clear labels printed with the necessary information can be placed on the wall beside or beneath the work. Set up a discrete payment station. This is not merely a show-and-tell, it's an opportunity to sell some of your work so make sure you have the tools available to complete transactions. A bar or small table works well to hold a cash-box (perhaps in a decorative container if drawer space is not available), receipt book and business cards or additional flyers. If you expect to take credit cards, have a terminal available or you can use an online processor and print receipts from your printer. Growing up, Jennifer consider almost every surface a creative canvas. Anything from the Doonesbury comic books she was given at age 4 to a spare telephone that found itself painted when she was 12. A music stand was an ersatz easel and after highschool she moved onto edible canvases of cakes and cookies. After starting her own webcomic this year, Jennifer spends a lot of her time in front of the computer in 'the Abyss' (craft room/studio/office) trying to balance life and fun and creativity.